These settings are available ONLY for Admin type users. 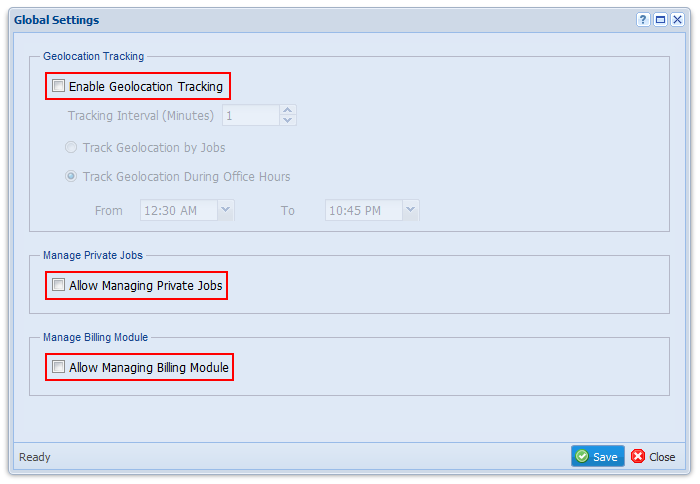 Using common settings, admin can enable Geolocation Tracking, Manage Private Jobs & Managing Billing module features. Step 1: Main view -> Click on drop-down -> Select from the drop-down list. Step 2: Enable required features, and click button. Only the Admin type users can activate this feature. This option provides the feature for users to make their own jobs and work on them while they are out of the workstation. Only the job created user can work on that specific job. 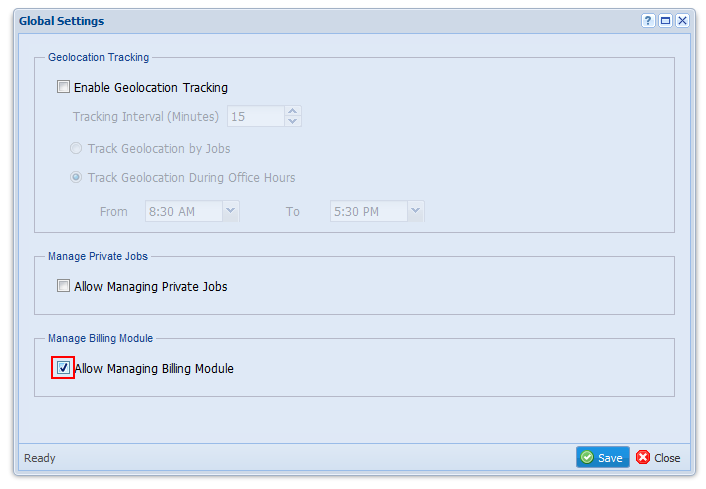 Step 2: In the “Global Settings” window, tick “Allow Managing Private Jobs” and click button. Note: Only Admin type user can make private jobs in to “Corporate” & corporate jobs in to “Private”. Only the Admin type users can activate this feature. Only activated if logged using mobile devices. This option provides the facility to track outstation users via Geolocation, filtered with Working Hours or Working Job. Step 2: In the “Global Settings” window, tick “Enable Geolocation Tracking”. Step 3: Change Tracking Interval Minutes as per your preference. 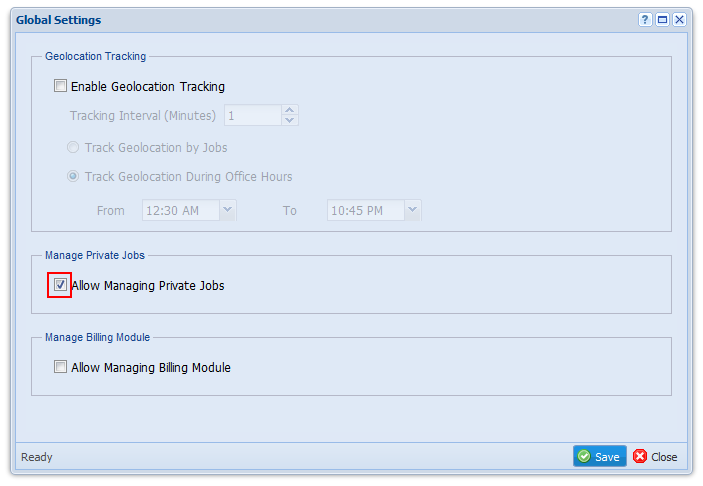 Step 4: Tick on what basis you would prefer to track the Geolocation, “By Jobs” or “During Office Hours” and click button. When geolocation details are tracked by “Jobs”, geolocation details are collected at each tracking interval only when a user starts working on a job. 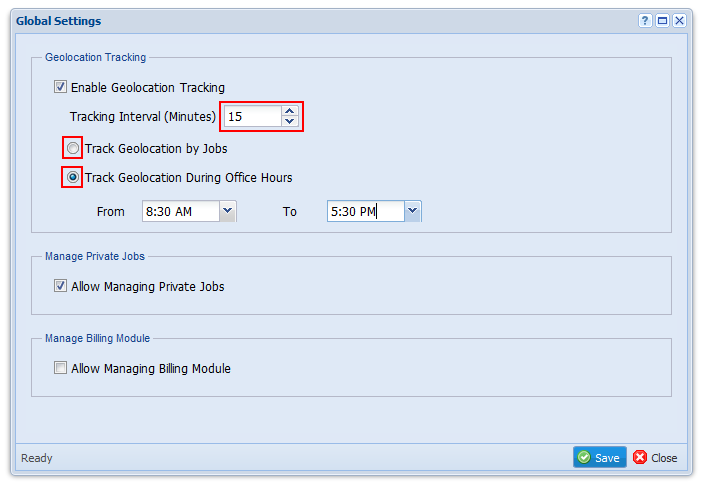 When geolocation details are tracked “During Office Hours”, geolocation details are collected at each tracking interval from the moment user log in to the system. This option provides the feature to enable billing module for the system. Step 2: In the “Global Settings” window, tick “Allow Managing Billing Module” and click button.